And then I put them on and went running. The first steps were tentative, easing in to running with something new on my feet. The first half mile of my route was on tarmac and I couldn’t shift the feeling of stiff heaviness, and then I hit the open trails of Leckhampton Hill and had something of an epiphany. Suddenly my shoes came alive and I understood all that they were trying to do. 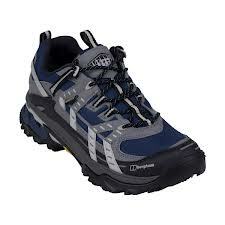 That stiffness translated in to a sure-footed confidence that the thin soles of other trail shoes couldn’t offer. No they aren’t light, but they pay that back by letting you run, and run, without that bouncy stone avoiding, root jumping, carefully descending dance that I was used to. On descending, these shoes are just brilliant. I couldn’t get them to slip, and I tried. I hit every stone, mud patch, dust and gravel patch I could find and they just wouldn’t fail. I also tested the claim of waterproofness and guess what folks, they weren’t kidding! Obviously being a shoe if you go ankle deep in a stream your getting soggy toes, but striding through puddles and mud like a 4 year old in their first wellies was incredible fun! More importantly they made the unavoidable mile through dew sodden grass a delight, and that makes me very happy. When I got out on to the big mountain trails of the Brecons they were even better, still offering that same sure-footed, sticky soled performance over the big rocks and steep drops. I have to admit that for simple trail running on fire roads and well built paths I will probably still revert to the trail slippers, but for the more demanding or weather-affected routes these shoes are perfectly suited to the changing terrain of trail running, and as such they will see a lot of use. Getting this in the post made me a ridiculously excited young boy! This jacket isn’t available until next year, it is also worth a lot of money and has had mentions/features in every outdoor and fitness magazine I read (including Outdoor Fitness, unsurprisingly) so getting my hands on one now was a treat. It has amazing technology (as do all Gore-tex products, I learnt a lot about the material whilst in the Brecons) but what makes this jacket exceptional is it has lots of flaps, and that’s a good thing. Hard to believe it stays waterproof with the gills all over it, if you want the science click the picture and get the lowdown. All you really need to know is this is new, newer than new, in fact this jacket more than anything else makes me believe we are in communication with an advanced race of aliens who are giving us their technology! Oh, and a word about the colours…not everyone’s cup of tea but I believe in be safe be seen whether I’m running the pavements or a lonely mountain and this jacket can certainly be seen! In use the jacket nearly always did what it was made to do, nearly. I’ve worn mine a few times now (ironically we had great weather in Wales and didn’t really need the kit much!). It’s done some kilometre sprints on early mornings and worked okay, certainly in the places it is vented. I did get very wet arms inside the jacket but I was working exceptionally hard in short sleeves and I sweated, a lot! In fairness I wouldn’t expect any material to have coped with that perspiration! I then wore it on a ten mile hill run, and it was incredible. During a hard climb I stayed cool, but then I was caught in not one but two torrential downpours. Let me assure you that being on the highest point for miles around when a lightening storm hits is never normally an enjoyable experience. However, putting up the jacket’s hood, zipping myself in and running through the storm is the most fun I’ve had in trainers for a long time. Importantly, after an hour of this thunderous fun, when I got back to the car and took the jacket off I was dry. Not just dry because the rain didn’t get in, but dry because the sweat got out. The final time I wore it was a night hike in the mountains through thick clag (low cloud, very wet) and combined with a long sleeved base layer it kept me very comfortable indeed. This jacket works. It isn’t cheap, and whether it is worth the money depends on how big your wallet is and how important comfort is to you, but I absolutely love it. It now hangs by my door, ready to go at a moment’s notice, and I’m looking forward to cold, wet winter runs so I get to wear it again and again. The thing about waterproof trousers is, even in the UK, I just wear them so rarely that it’s never been worth investing in quality. A normal waterproof trouser scenario runs something like this—> Walking along wearing some Craghoppers admiring the view – Ooh, that’s an angry looking cloud – Ah, yes, it’s raining a bit, sure it will pass – It isn’t passing, it’s getting heavier – I’m really quite wet now, I wonder if it’s worth putting on my overtrousers – Actually I’m getting really quite cold now, time for the waterproofs – Hmm, the rain has stopped, I’m boiling hot in two pairs of trousers one of which is soaking wet and the day is no longer fun. So when I opened a parcel and found these trousers I was obviously overjoyed at having such wonderful free kit, but knew they would only ever live in the side pocket of my rucksack and be part of every soggy disappointment I subjected myself too. It seemed a shame as the trousers look absolutely wonderful. Far more stylish than other waterproofs I’ve owned, they looked great on and it seemed a shame they’d hardly ever get seen. 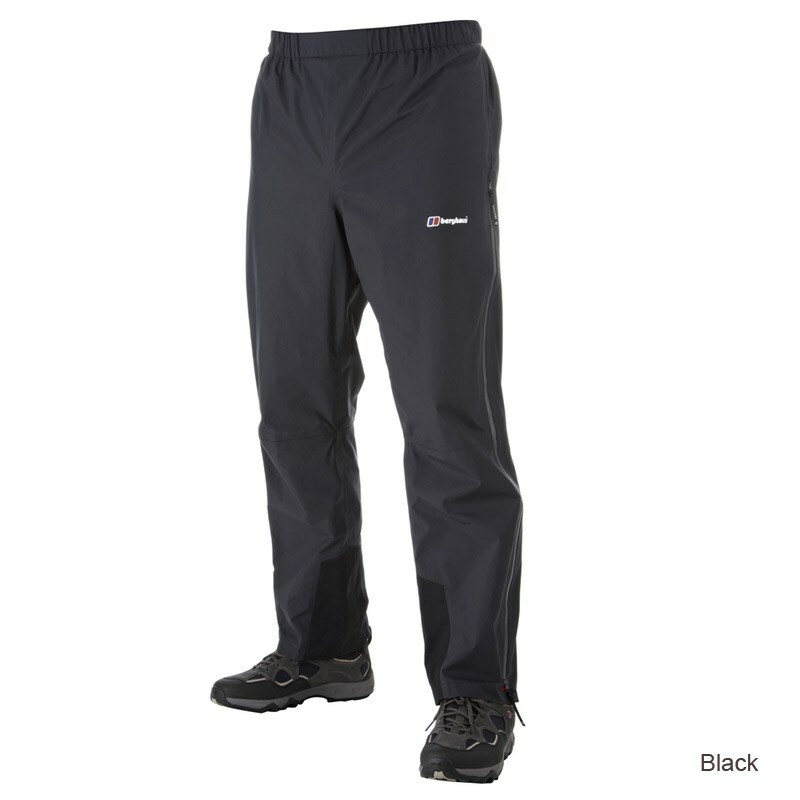 They were also really comfortable, and with the lining mesh from the knee upwards and the solid liner around the calf and ankle they were far superior to the single layer trousers I was used to sweating in. So, whilst in Wales, I decided on an experiment. Dressing for a night hike in thick clag I donned just the Berghaus trousers. Thanks to the lining they instantly felt comfortable against bare legs, not like wearing waterproofs at all. The walk included cutting through heather and knee high grass and I was gloriously dry throughout. If I’d been in my usual trews they’d have been soaked and subsequently I would have been cold and uncomfortable. The walk was such a success that I opted to wear them again the next day for a series of tasks and an afternoon of survival training. It was the perfect decision! The venting on the sides kept me cool when working in the sun, and when I was scrabbling around on the forest floor the material kept me dry and proved very durable. I was amazed at just how comfortable they were all day and performed not at all like claustrophobic waterproofs. I actually forgot that’s what they were until I went knee deep in a stream and stayed dry! I’m now looking forward to the autumn really settling in so I get to wear these trousers again, along with the trainers and amazing jacket I’ll be looking good and feeling good, and I now wish the rest of my wardrobe was this impressive! This entry was posted in Kit and tagged Berghaus, fitness, Gore-tex, running. Bookmark the permalink.